We’ve all been there: We’re at an important event, and suddenly we feel uncomfortable. Upset stomach, indigestion, heartburn, or irregularity may seem to strike out of the blue. Quick fix solutions claim to cure what ails us, but many of us don’t want to rely on harsh over-the-counter products. We want to take control of our digestion. 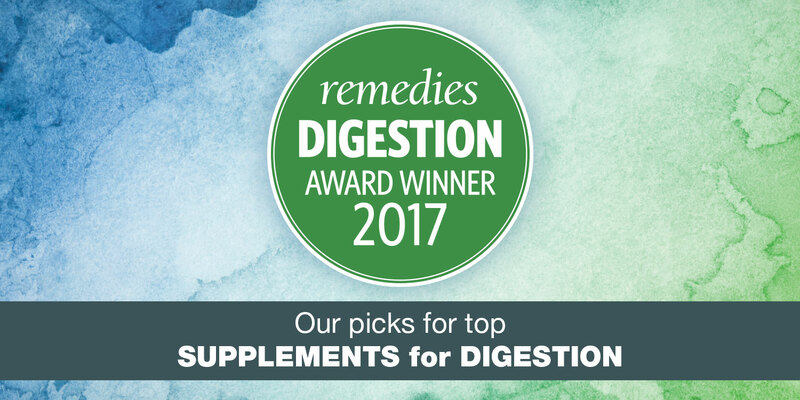 Lucky for us, there are excellent natural products that can help with everything from acute indigestion to chronic digestive disorders. EuroPharma Terry Naturally BosMed Intestinal Bowel Support contains clinically studied boswellia purified to remove pro-inflammatory compounds. Boswellia and additional herbs offer a broad spectrum of intestinal benefits, including relief of cramping, gas, bloating, and diarrhea. Genesis Today’s Digestion Enzymes & Herbs blends papain from papaya, bromelain from pineapple, ginger, fennel, and dandelion leaf, to support healthy digestion. Delayed-release vegetarian capsules bypass the stomach, and enzymes are released in the intestines for optimal digestive support. Just Thrive Probiotic & Antioxidant uses four DNA-verified, spore-based bacillus strains that have been prescribed medically in Europe and Asia for decades. These strains can produce potent carotenoids (antioxidants) that are absorbed by the intestines. King Bio Aquaflora High Potency 9 Candida is a multistrain homeopathic formula designed to temporarily relieve symptoms due to overgrowth of Candida albicans yeast in the intestinal tract, which can cause constipation, diarrhea, and flatulence. NOW Respiratory Care Probiotic supports digestion and provides seasonal respiratory support with probiotics used in more than 60 scientific studies. Clinically tested NCFM can rapidly populate the intestine—helpful during and after disruptions to intestinal microbiota. Wakunaga of America Kyolic Kyo-Dophilus Probiotics Plus Enzymes contains three beneficial probiotics along with four key digestive enzymes that assist the body in breaking down proteins, fats, carbohydrates, and dairy into absorbable nutrients. Enzymedica Digest Spectrum supports people with multiple food sensitivities. It combines strains of amylase, protease, lipase, and cellulase with enzymes for gluten, phenol, lactose, and casein digestion. Thera-blend enzymes work throughout the entire digestive system. Flora Udo’s Choice Advanced Adult Enzyme Blend is formulated for seniors who need extra digestion support. This vegetarian blend aids in the digestion of proteins and fermentable carbohydrates and also helps prevent lactose intolerance symptoms. JR Carlson Natural Digestive Enzymes contain protease, amylase, and lipase. Under simulated conditions, each tablet digests 34 grams of protein as well as fat and starch. The enteric-coated enzymes dissolve in the intestines to aid digestion. American Health Enzyme Probiotic Complex contains nine clinically researched enzymes that help digest proteins, carbohydrates, and fat to help you better absorb nutrients. Each capsule contains 2 billion probiotic micro-organisms that support the digestive system. Natural Factors Ultimate Probiotic 12/12 Formula provides 12 proprietary strains—a synergistic blend of Lactobacillus and Bifidobacterium—with a potent concentration of 12 billion active cells. Nordic Naturals Flora Probiotic Daily offers a blend of four probiotic strains, including Lactobacillus acidophilus DDS-1, plus prebiotic FOS. These research-supported strains survive passage through the GI tract and support digestive wellness and immune health. Renew Life Ultimate Flora Extra Care Probiotic is a high-potency formula with 10 strains of Bifidobacteria and Lactobacilli to help relieve digestive discomfort and promote immune health. Each capsule contains 50 billion live cultures. Created by David Perlmutter, MD, an expert in the human microbiome, Garden of Life Dr. Formulated Probiotics Once Daily Men’s 50 billion CFU formula consists of 15 diverse strains of probiotics to support colon health. Bluebonnet Nutrition Ladies SingleDaily Probiotic 50 Billion is a scientifically substantiated probiotic formula containing seven DNA-verified strains of bacteria such as Lactobacillus rhamnosus that support women’s digestive, immune, and urogenital health. Infused with cranberry extract.